Hoover Belle gown - he-he!" The funny thing is, ever since I purchased the shower curtain I had the same thought. 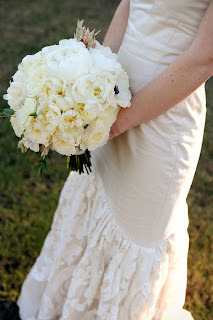 I envisioned the fluffly cotton ruffles in a different life -- not my Hoover Belle gown, but as a running-through-the-fields-in-my-overly-fabulous-dress kind of dress. And then I saw this in the latest issue of Rue. It's more formal than my imaginary dress (that is paired with imaginary brown wedges, by the way), but you can start to see the vision, right? If you're thinking of translating the concept literally, this gal made her wedding dress from Anthropologie shower curtains! Image by Ooh! Events via Style Me Pretty. I'm not really planning on dressing in the shower curtain... for now. But sometimes when I get stuck on details in a room, I relate the textiles to the pieces I might wear, then envision the accessories I might match with them. Sometimes it works, sometimes it doesn't. By the way, I have an idea for tweaking the shower curtain. One that's just crazy enough that the seamstress was really confused when I tried to explain it. Ha! I heart you ;o) This made me laugh and I can imagine you saying every single word "out loud!" You could always make it into a very chic bathing suit for the summer ;o) It's already ripped into some shreds! I do like my imaginary dress, but a a bathing suit? THAT'S visionary, darling! So visionary I can't even en-vision-ary it. Two-piece, or one-piece?